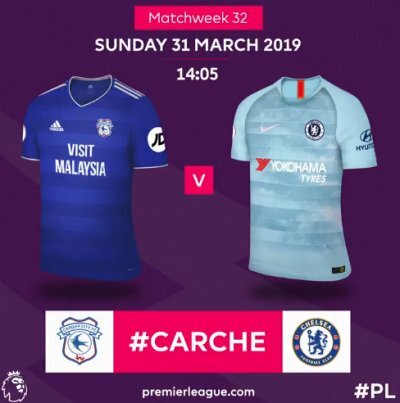 Cardiff welcome Chelsea to the CCS on Sunday, ko 2:05pm. Game is live on Sky. It's a big few days for City with a trip to Man City to follow on Wednesday so if the Bluebirds are to finally get something from a top six team it could be against under pressure Maurizio Sarri's side. Cardiff are without Callum Paterson for the Premier League home game against Chelsea on Sunday. Paterson damaged ankle ligaments playing for Scotland in their Euro 2020 qualifier in San Marino and will play no further part this season. Sol Bamba (knee ligaments) and Matthew Connolly (dislocated ankle) are also sidelined, but Harry Arter is expected to feature after missing the Republic of Ireland's Euro 2020 qualifying victory over Georgia on Tuesday. Ruben Loftus-Cheek is expected to shake off a back issue in time for Chelsea's trip to Cardiff on Sunday. The midfielder missed out on England duty due to his injury but should be ready to return for the Premier League contest. Davide Zappacosta's ankle problem will be assessed, as will Ethan Ampadu's back concern. Cardiff City have won 71% of their Premier League points this season in home games (20/28) - only Fulham have a higher percentage (88%). Chelsea have lost only one of their 17 Premier League games against Welsh opposition (W12 D4), losing 0-1 at Swansea City in April 2016 under Guus Hiddink. Cardiff have lost their last 16 Premier League games against the 'big six' sides, last avoiding defeat in November 2013, drawing 2-2 against Manchester United. Chelsea have already lost against Wolves this season - they've not lost against two different promoted sides in a single Premier League season since 2012-13 (vs West Ham and Southampton). Neil Warnock has faced Chelsea four times at home in the top-flight, each time with a different club; he won in 1991-92 and 2010-11 (with Notts County and QPR respectively) and lost in 2006-07 and 2014-15 (with Sheffield United and Crystal Palace respectively). Chelsea's Eden Hazard has scored five Premier League goals in three appearances against Cardiff City, although all his goals have come at Stamford Bridge; no player has more Premier League goals against the Bluebirds than Hazard (Gerard Deulofeu and Luis Suárez also five). Chelsea's Gonzalo Higuain has scored three goals in his seven Premier League games so far, with all of them coming against teams in the relegation zone (2 vs Huddersfield, 1 vs Fulham).